In need of a better way to store, share and backup all of your data? Then here's your chance. 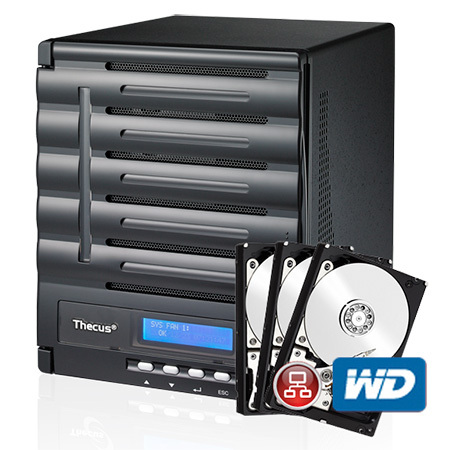 HEXUS has teamed up with Thecus to give you the chance of winning an award-winning five-bay N5550 NAS worth over £450! And that's not all, as Thecus will also be throwing in a trio of 1TB WD Red hard disks designed specifically for NAS systems, raising the total prize value to £650! This awesome little box comes equipped with an Intel Atom processor, 2GB of memory, USB 3.0 connectivity and a truly exhaustive feature set. Another one ! Cheers guys. Maybe one day…. Red HDD's as well makes this an excellent comp.